Pay Based on Consumption at the conclusion of your event with a Cash Bar. 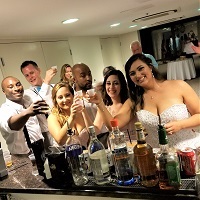 The term "Cash Bar" refers to Bars that have not been prepaid and Client will pay their own tabs directly to bartender based on consumption during the event. The term does not refer to the method of payment (cash or card only is accepted). Available at the Venue at Royal Palm Grille only (offsite bars will require a package purchase). There is a $400 Minimum Guarantee for Cash Bars. If the minimum is not reached by the conclusion of the event, client agrees to pay the balance of the unpaid guarantee. There is a $100 Set up fee for Cash Bars in the Event Room. No Set up fee is required for the Beach Bar, Pool Bar or Main Restaurant Bar. 18% Gratuity will be automatically charged to all tickets. Additional Option: Want to provide Drink Tickets? You can do so with a Cash Bar. Just let us know how many tickets you would like your guests to be given and what they are good for (i.e. beer and wine only, anything goes etc). We will ring up these drinks on 1 tab and you will be responsible for paying for these drinks at the conclusion of the event. We can provide the tickets for no extra price or you may want to make your own. *Pricing listed above is not guaranteed and is listed here for estimate purposes only and may vary.